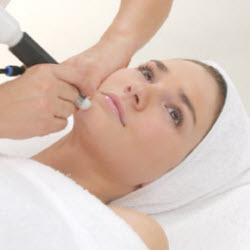 Microdermabrasion is one of the more recent skin-care techniques to have crossed over from Hollywood to the mainstream. It’s being advanced as an “instant facelift” – an effective alternative to costlier and more invasive procedures like plastic surgery, chemical peels and injections. Recently, more and more men are trying it, instead of pursuing cosmetic surgery. Microdermabrasion is one of those revolutions in cosmetics and medicine that has enabled men and women alike to rejuvenate, clear, and conceal much more of their skin’s appearance than was ever done before. This procedure can be used to minimize slight aging lines and spots, acne scars, and pore sizes, improving the overall condition of your skin. Research in this field is consistently being conducted to improve the results that microdermabrasion can produce, its reliability, and its effectiveness. Microdermabrasion / Microexfoliation allows a doctor to smooth, refines, rejuvenate and exfoliate the skin in controlled increments and it offers several advantages over other types of skin treatment methods (such as dermal abrasion or use of the glycolics). Anaesthesia is not required, it is quite tolerable and the treatment intensity can be adjusted for each patient’s comfort level. There is no “down time”. The face is typically red for up to 24 hours, but it is easily covered with make-up. The results from each micro-exfoliation treatment is through the regrowth and replacement of epidermal tissue. The adverse results of dermal abrasion are thus avoided. Microdermabrasion can be administered to patients with dark skin. There are generally no adverse pigmentation effects following treatment. Removal of lines and wrinkles. Removal and/or reduction of surgical scars and accidental scars. Removal of hyper-pigmentation (i.e. age spots). Lessening of acne scars. Removal or lessening of stretch marks. Repair of sun-damaged skin. Repair and removal of unwanted tattoos. It is also an excellent “deep exfoliation” treatment. Skin will be clean, clear, smooth and healthy. It promotes regrowth of new cells to replace those abraded by the corundum crystals. Micro-exfoliation is effective both before and after laser treatment and / or surgical face lift. Micro-dermabrasion is not meant to be a replacement for a face lift, a face peel or laser surgery. It is an adjunct or complement to each one of these procedures. Aspiration brings blood to surface and with the blood, new nourishment and energy for epidermal tissue cells. Exfoliation causes the immune system to “kick-in” with repair response that is accelerated to bring new tissue growth to the treated area. New tissue growth will be healthy epidermal tissue and not scar tissue. Rejuvenated skin will be more durable. Epidermal skin will age in a normal fashion.